A Block That Changed To A Pyramid! In 1963, when I was hired by Butte, Herrero and Hyde who were located in the Belli Building, the Mont­gomery Block building that had been at the nearby corner had already been razed. There was a fenced, large, open lot at that loca­tion. It was still a vacant lot through the late 1960s. Then news­paper arti­cles and an uproar emerged about the plans to build a very tall “pyramid” which was designed in 1969 to tower 1,040 feet on that lot at the corner of Wash­ington and Mont­gomery streets. Alvin Duskin at that time was running for the office of San Fran­cisco Super­visor. He was known for selling women’s clothing, a product from his father’s knit­ting mill. Some of his knitted fash­ions had long skirts — but when he began making a sweater, a little longer— that was a mini‐dress! That was during the 1960s! His busi­ness grew with a factory at 520 Third Street. He had 250 employees. Here is an ad (too much to read, here) but the photos and head­line give a clue to his argu­ment for Propo­si­tion T that was to limit the height of new construc­tion. The topic of the day was this issue. The San Fran­cisco Chron­icle called it “…a pyramid so unusual it might have drawn a wink or a gasp from the Sphinx.” There were praises and crit­i­cisms from far and wide. Sixteen local artists created an Alvin Duskin campaign “coloring book”. At that time, Bob Pease was the pres­i­dent of our commu­ni­cating arts club. Recently, I emailed and asked him about the coloring book, he wrote: We had our monthly meet­ings at Gino’s on Spring St. where Alvin was invited to talk about Prop.T — we got excited and did the coloring book all with donated art from our friends, ended up printing 100K in two print­ings! It almost worked! That was our major promo at the time. Glad to see Alvin never giving up! The results of early polling started plans for height restric­tions in many districts, but on Elec­tion Day, Propo­si­tion T failed. Alvin Duskin went on to cham­pion the anti‐nuclear move­ment in the mid‐1970s. He also became a pioneer in renew­able energy and carbon capture. 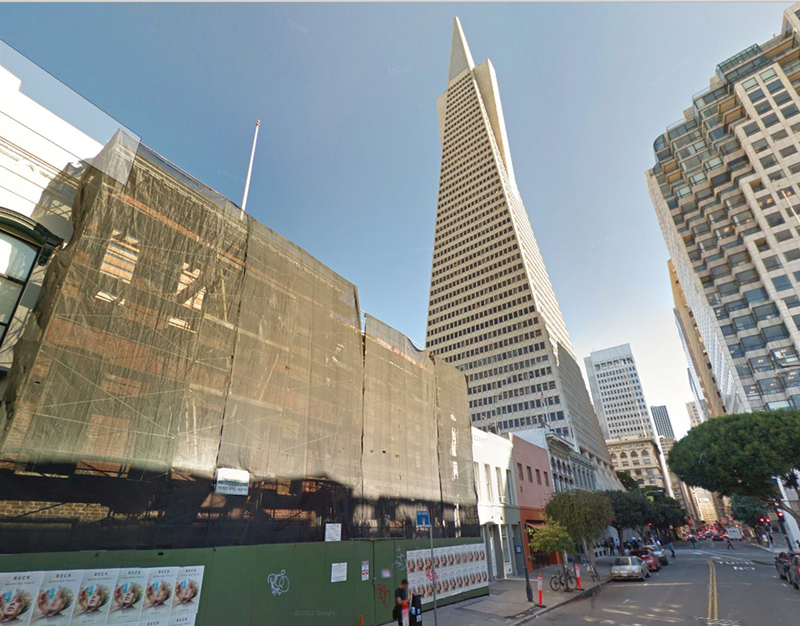 As it turned out, the plans for William Pereira’s Transamerica Pyramid were changed. The height was trimmed down to 853 feet, which neces­si­tated “ears” on the pyramid — the ears were the loca­tions of the two eleva­tors. The construc­tion was completed in1972. If built today, with the extreme heights of the new build­ings in San Fran­cisco, The Pyramid would be its orig­inal planned height and all four sides would be smooth and flat. I was able to visit the top floor of the Transamerica Pyramid, when I was a part of the design group who created the Transamerica Annual Report. That top floor was small, but the views were, and still must be, amazing from that unique loca­tion. 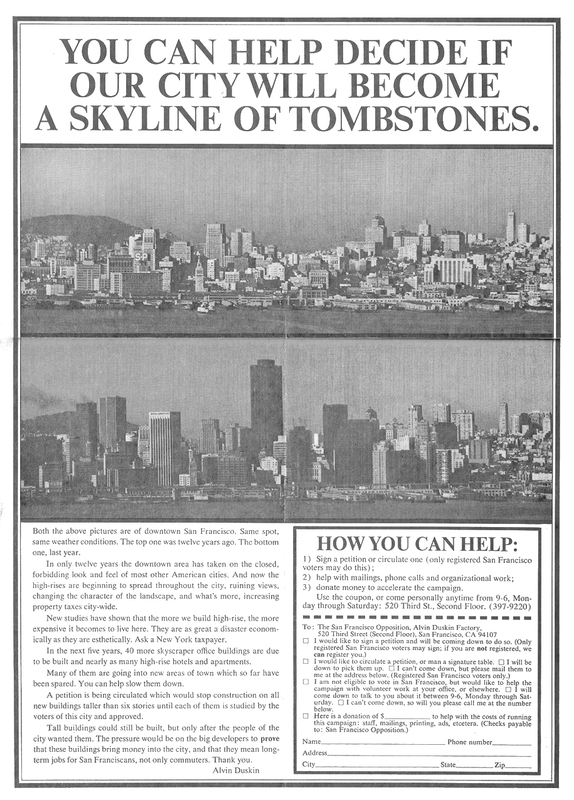 The Belli Building, did not survive the Loma Prieta Earth­quake of 1989. Unsup­ported bricks don’t make it. Melvin Belli’s widow, although a person repre­senting the San Fran­cisco Land­marks Preser­va­tion Advi­sory Board, was not able to save the land­mark building. In this view, it is under wraps to protect pedes­trians. View of today’s Mont­gomery Street, Belli Building to T. Pyramid.